← Cracker Barrel Hash Brown Casserole … my way! Raise your hand if you like chocolate! Raise your hand if you like Oreo cookies! Almonds are a healthy snack and everything on a stick is fun … right? 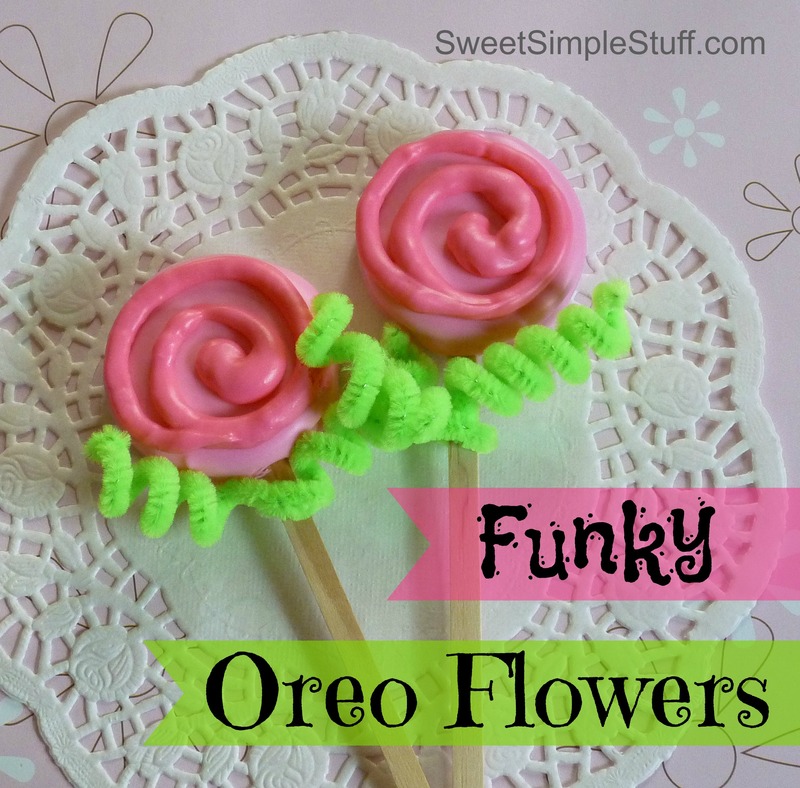 Therefore … this must be a sweet, fun and healthy Oreo Flower Pop! It has all of the necessary elements … Oreo cookies, on a stick, dipped in chocolate with chocolate covered almonds (that means double chocolate!) for the petals and a few sprinkles in the center for a little extra fun 🙂 These pops are guaranteed to put a smile on everyone’s face! These almonds came from Costco long before Easter and were kept hidden for this project. I have not seen them recently, but Jordan almonds, almond M&M’s or any oblong shaped candy could be substituted. The colors are perfect for Mother’s Day and spring flowers … no green thumb necessary! Replace top on cookie and melted candy. Let candy firm up. Dip and cover cookie in melted candy, tap off excess and even drag bottom across edge of bowl. Lay on prepared tray. Place 5 almond on cookie to form flower petals. Chill for a few minutes or let sit at room temperature until totally hardened. 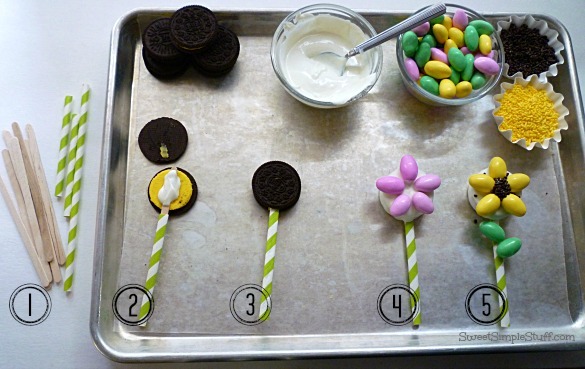 Add a little melted candy in flower center, add sprinkles. Use a dot of melted candy to attach 2 green almonds to straw as leaves. Let the candy harden, then tap off excess sprinkles. Do you have any special plans for Mother’s Day? I ♥ your comments! Thank you Lisa ;). Great idea … teachers deserve flowers too! 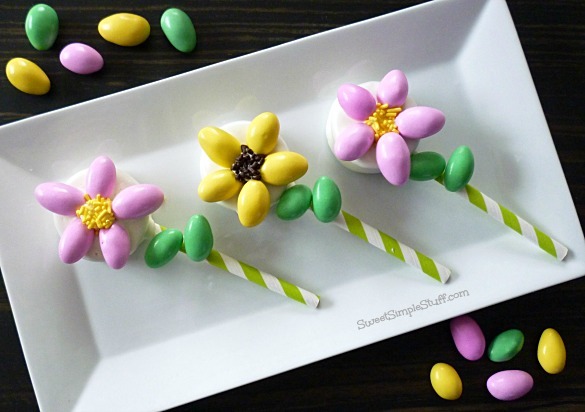 There are multiple times of the year these quick and easy flowers would come in handy. Let’s not rush Christmas, but wouldn’t red almonds with black sprinkles in the center make nice Poinsettias? Green only almonds for St. Patty’s Day. Love when you do goodies that can be used for numerous holidays or just any day when chocolate is on your mind. Thank you Tavette :). Once again, you made the wheels in my mind start turning! Those are supper cute. Love the colors! Thank you Sarah :). 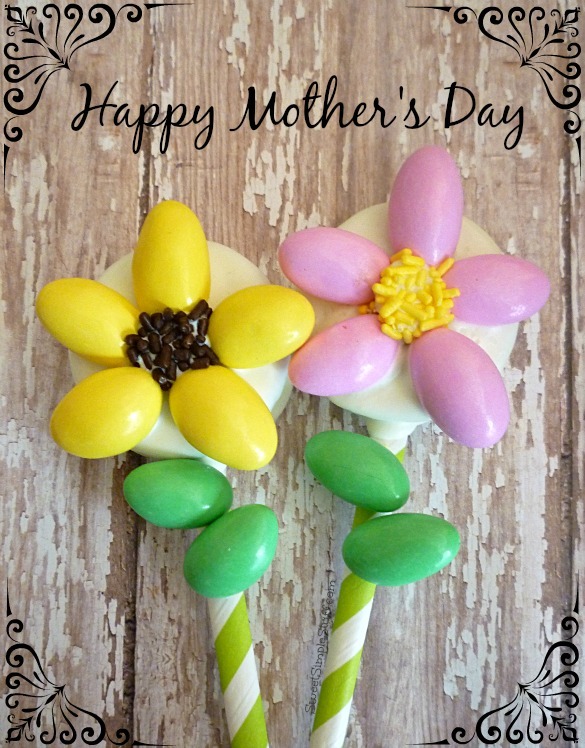 You can never go wrong with a candy flower on a stick! Happy Mothers Day to you Brenda! 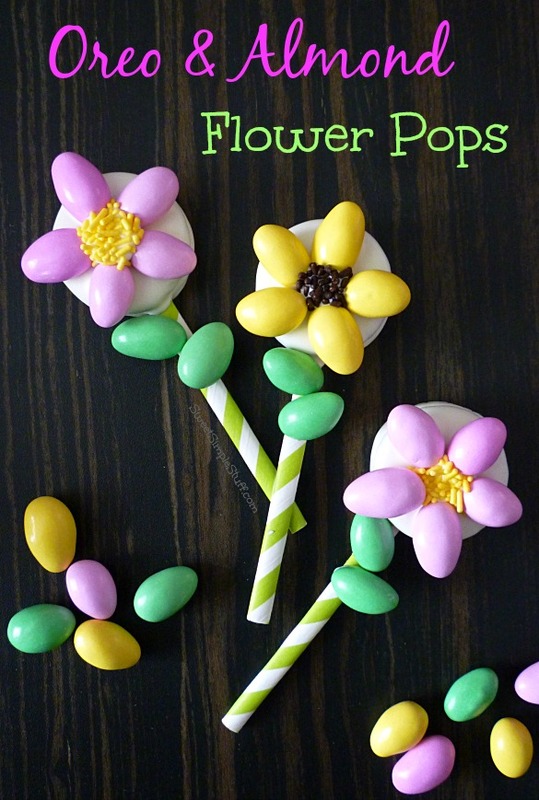 These little oreo and almond flower pops are so adorable and a fun way to celebrate the coming of spring. It is the start of the rainy season here in Hong Kong so the only flowers I may see for awhile are in the form of a lollipop. Pinned, too cute! those flowers are so cute and what a cute bouquet they would be putting in a clay pot filled with a section of Styrofoam and covered with green shredded paper at the base. Was thinking; those who can’t eat nuts probably could use jelly beans or something similar. Thank you Lisa 🙂 I know what you mean … never enough time!